If you want to combine many excel files into one file and you don’t want to do it manually, you have come to the right place. This piece of software will allow you merge as many excel files you want, say 500-1000 excel files. This tool will provide you various options of formatting before you merge your files. Download the consolidator.xlsm from the link provided at the top and at the bottom of this article. Place all the excel files, which you want to combine, into one folder (make sure all files are closed). 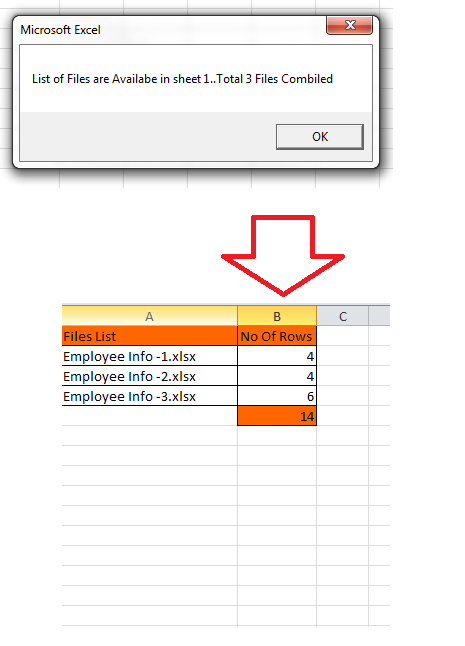 “Remove blank rows” if available in any of this files while combining. “Remove repeated headers” if available in any of this files while combining. Provide the folder path where you all excel files are stored. 6. That’s it, your all the files from the specified folder will be combined into one and gets stored in to Sheet 3(“Combine”). 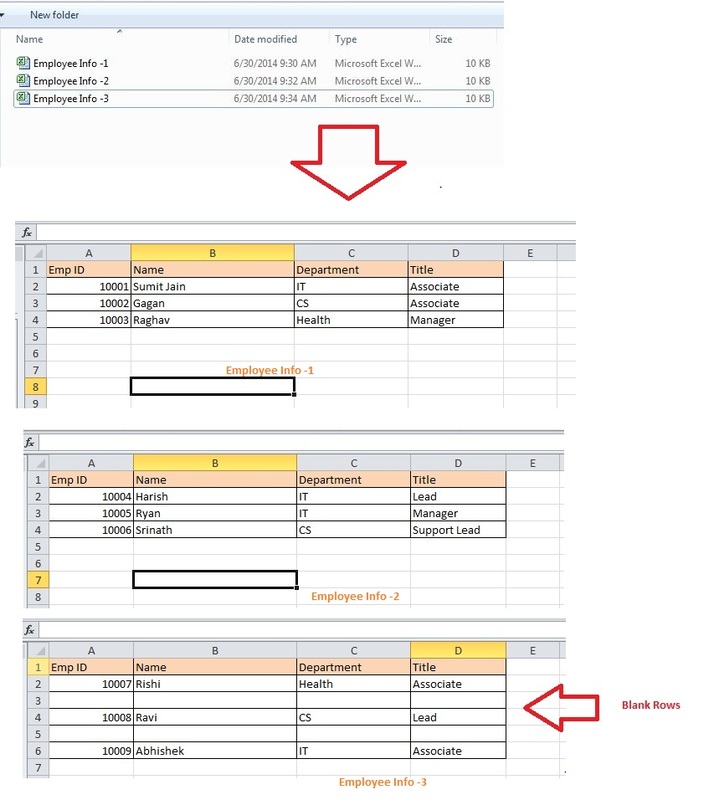 At the end you will get a message box stating how many files are combined and name of all the files combined in sheet 1.
mainworkbook.Sheets(1).Range("B1").Value = "No Of Rows"
VBA-Excel — AttachmentFetcher — Download all the Attachments from All the Mails of Specific Subject in Microsoft Outlook . This website looks great. It seems this website fulfill all my needs. Step by steps codes giving good understanding to the users. As a learner I would rate 9 out of 10. If you share the password for the attached file then I would rate 10 out of 10. Once again thanks. Thank you for sharing this great utility. I’ve used it to combine many individual txt files into one. One problem I discovered that i have is that, sometimes I get a 12 digit number. After the files are combined this field looses the original data and is replaced with a truncated entry (123450000000)). Currently I look for these 12 digit entries and add them manually. Are than any changes that I could make to the global variables that might accomodiate these numbers? Excellent work buddy. while working on my project, bumped into your tool. so much inline with what i need. possible for you to share the password of this VBA code component ? need to customize few things . you can send it to my email if sharing here is not what you like to do. Sent the password to your mail. If you share the password also, It will be great. Please!! Thank you for this SJ, it’s proving to be extremely useful for me! Is it possible to make the combine include files within sub-folders? Hello SJ! Your work is amazing but i just need to edit some things to fit my needs, is it ok if you also share the password with me? Thanks in advance! Great tool. Exactly what I’ve looked for. 1. In my workbook I have two headers rows. Is it possible to remove both of them when more then 1 file? 2. Can you please share the password with me? I would like to edit few things. Thanks. Any idea how can I remove the second header as well? My each excel file has two sheets: sheet1 ,sheet2, how to combine them into one new excel file but keep all sheet1 in new excel sheet1 and sheet2 in new excel sheet2? Is it clear? Thanks in advance! You need to make few changes in the code. 1. copy the data from sheet1 and put it in sheet1 of new file, existing code will do that for you. do let me know if you need further help. Thanks for your reply. I am not very clear about the second step. I have over 50 excle files,each has sheet2. How to activate them? I appreciate your help. if you still face problem, let me know, currently busy but i will try to provide the solution on weekend. Hi! Thank you for this great tool. Can you send me the VBA password? It will be greatly appreciated! Thanks! Sent at your mail id. Good luck. Hi thank you for the tool. Really help me. But do you mind sharing the password? this vba works great!! will you provide the password to me please? thanks! I am getting an Overflow error when consolidating. I need to combine 10 files with about 20,000 rows on each file. Is this something that can be fixed on the code? I hope you can share with me the password. will you pro­vide the pass­word to me please? thanks! Please send met he password to the vba. Please send me the password to the vba. Hi, I need to modify the script slightly, would it be possible to obtain the password? Hi, great tools. but for the blank row could it be included those formula blank row ? I mean Formula on the cell, but the result was blank. possible excluded as well? hi buddy!! extremely helpful. can you please share the password of this, i need to make some changes in it. Hi, this is exactly what I needed. I run into some problems while using the code provided in this post (specifically with removing the headers part which i’m unable to fix on my own). Is it possible to send me file password? [email protected] thanks. Hi, Please provide the Password please, I need to modify the code little bit to fulfil my need. very useful tool for my project! Many thanks. could you please email me with the password? I need to make a few changes on VBA. Hey Great Stuff SJ !!! You really saved me a lot of time, i was working on the same lines since the last two days but was encountering some issues with my code needed to consolidate like 100 .csv files, this thing is just what I was looking for !!!! Thanks for the wonderful work you have done. However I am receiving Overflow Error message could you please mail me the password at [email protected], so that I can see if there is a solution to resolve this issue. This tool is very useful. It helped me a lot in my projects. Im still making some format modifications in the combined files though. But overall, this is really a time saver. Could you please send me the pw, i would like to make a few modifications to address some of the format issues. Thanks in advance. send me could you please email me with the pass­word? I need to make a few changes on VBA. Thanks for great code but requesting you to share password i want to make changes in code. Using this very useful code but I need to modify it. Can you please send me the password as many others have also requested. Just curious, why protect with a password as so many posts here are requesting it? Please do not publish my email address. 226 queries in 0.119 seconds.